Captain Bobs Pontoon Boat Rentals Dunnellon Florida Rainbow River Withlacoochee River Boat Rentals. Looking for a great day of adventure on the water in West Central Florida? Come rent a Pontoon Boat or even an aluminum or fiberglass fishing boat from Capt. Bob's Boat Rentals on the Rainbow River and the Withlacoochee River. While away the day as you cruise down some of the most scenic and beautiful rivers in the Dunnellon, Florida area. Located just minutes south of Ocala, Dunnellon Florida offers some of the best fishing and sight seeing around. 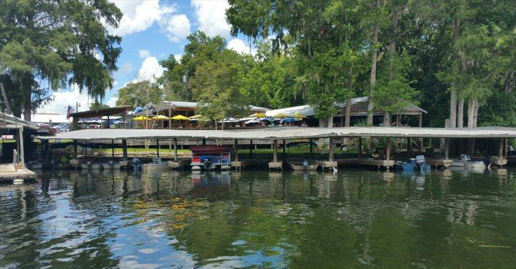 You can enjoy lunch at the Blue Gator Restaurant overlooking the Withlacoochee River, then rent a boat and cruise down the Rainbow River, one of the cleanest and clearest spring fed rivers in the State of Florida. Enjoy a day of fresh water fishing or just float down the river and enjoy the wildlife including otters, turtles, opossum, raccoons, water fowl and wading birds even osprey and American bald eagles. After a long relaxing day of fishing on the Withlacoochee River you can spend the night at Anglers Resort Motel right here beside the river and enjoy the live entertainment at the Blue Gator restaurant on Wednesday thru Sunday. And the next day you can reserve a seat on the famous Capt. Bob's Airboat Tours. Hang onto your hats, it's a ride you'll never forget!